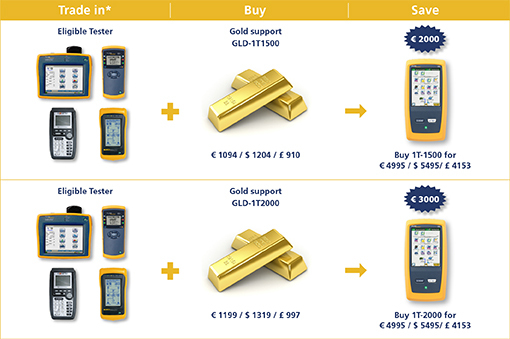 Trade up from your existing network tester to the OneTouch AT with automated pass/fail troubleshooting and performance measurement andsave up to € 3000! receive your new unit at the price of the 1T-1000! *Eligible trade-in testers: EtherScope and Series II, OneTouch 10/100 and Series II, NetTool Series II, Agilent FrameScope Pro, Ideal LanXPLORER, Microtest Compas, and Psiber LanExpert. TheOneTouch™ AT Network Assistantis an all-in-one Gigabit Ethernet troubleshooter for copper, fiber optic and Wi-Fi networks. It provides a client view of network performance so you can resolve problems fast and complete deployment projects on time. By improving each step of the process, the OneTouch AT frees up nearly a week each month historically spent troubleshooting problems.